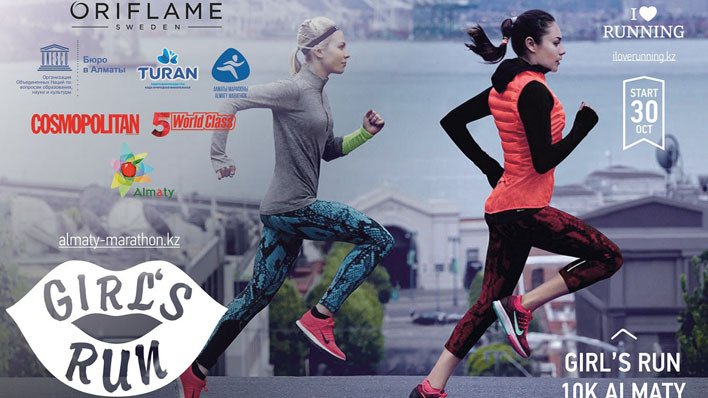 On October 30, 2016, the city of Almaty will host the «Girl’s Run 10k Almaty» to support women's participation in sports. The project is implemented under the auspices of UNESCO and with the active participation of the UNESCO Almaty Office. The "Almaty Marathon" Foundation and the school of proper running «I love running» with the full support of Almaty Mayor Office invite girls and women to participate in an unusual race entitled «Girl's Run 10k Almaty» within the framework of UNESCO's global programmes in the field of physical education. Thus, organizers of the event intend to attract a female audience to engage in mass sports and healthy lifestyle. "Over 5 years of organisation of the “Almaty Marathon" and intermediate runs we have seen a significant predominance of male participants. Women tend to be more difficult to decide to go to the start of mass sports events, even such an accessible, like running. In this regard, in cooperation with school of proper running «I love running» we decided to organize a women's run, which will allow to beginners and sport lovers to participate in it ", - commented Saltanat Kazybaeva, Director of the Fund “Almaty Marathon”. Distance of 10 km is selected as the optimal and comfortable for the run in «fun run» style. The task is not to identify the fastest among the participants, although the prizes are provided. The main purpose of such a start is to encourage women to lead an active lifestyle and jogging. By organization committee it was decided to appoint a Kazakhstan superstar, popular singer and TV presenter – Luina as a Goodwill Ambassador of «Girl's Run 10k Almaty». According to the organizers, Luina represents the image of a harmonious and successful women, who is capable to inspire Kazakh women for an active life. The singer not only supported the project, but also expressed a desire to run with all participants. "Women are actively engaged in sports is our step ahead on the way to the health of the nation and future generations. We actively support initiatives aimed at the development of women, improve their health and social status. This run will also strengthen the UNESCO’s sports ideals, based on honesty, fairness and mutual respect. We hope that the project will find an active response among the female residents of our country", - added Arina Plokhikh, Programme Specialist of Social and Human Sciences, UNESCO Cluster Office in Almaty. The winners of the run, who took the first three places will receive medals, certificates and gifts from the partners. For all other participants memorable medals are also provided.